Researchers from Imperial College London report that the white cliffs of Dover contain the fossilised remains of cosmic dust. The significance of this discovery, published in the journal Earth and Planetary Science Letters, is that the fossilised cosmic dust could provide a new source of information about the early solar system. The team also report in a separate study published in the journal Geology that they’ve discovered a way for determining if cosmic dust was clay rich. Clays can only form if water is present, so a method for determining clay content could act like a cosmic divining rod for determining the presence of water rich asteroids in our solar system. 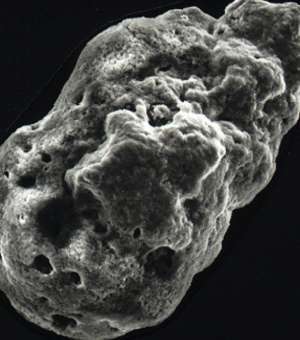 Cosmic dust has been previously found in rocks up to 2.7 billion years old. However, until now only cosmic dust that was very well preserved could be studied by researchers. The significance of the their new study says Mr Suttle is that less well preserved fossilised cosmic dust can now also be located and examined in detail. 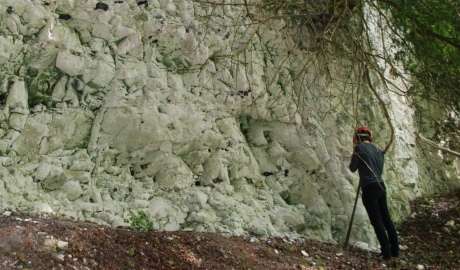 Previously, scientists had not known that the white cliffs of Dover contained fossilised cosmic dust, although it has been located in other rocks before. The researchers suggest that the reason it has been overlooked is that the fossilisation process masked the true identity of the dust particles. This is because when the dust fossilised it replaced the original mineral content with different materials. At the same time the original minerals in early fossilised creatures were also being replaced with similar materials, masking the identity of the space particles. 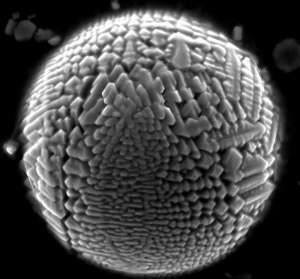 The team determined that fossilised cosmic dust was present in the chalk samples by spotting their distinctive spherical structure and christmas tree-like shape of their crystal content. In geological terms, pristine cosmic dust particles are a relatively recent record of events in the solar system. Now that they’ve located a new source of cosmic dust, which is much older, the team says it could help them to understand events beyond Earth such as major collisions between asteroids, which have occurred much earlier, perhaps even around 98 million years ago – a time when cosmic dust records have been difficult to unearth. In the study in the journal Geology, the Imperial researchers have calculated that olivine crystals in cosmic dust act as a proxy for clay particles and the presence of water. As cosmic dust enters the atmosphere it can reach searing temperatures of more than 600 degrees Celsius and this causes its original mineral content to undergo transformations where they turn into glass and crystals. The heat also vaporises any trace of water molecules, making it difficult to determine if it was present. Now, Dr Genge and his colleagues have analysed past studies and carried out some calculations to determine that shattered pieces of olivine crystals contained in cosmic dust is a proxy for water. This is because the loss of water from the interior particle has a cooling effect leading to extreme differences in temperature between the surface and the core of the particle. Olivine crystals shatter when one part is hotter than the rest because huge stresses develop owing to differences in expansion. Dr Genge has calculated that around 75 per cent of the cosmic dust that lands on Earth contain shattered olivine crystals. As cosmic dust particles are the pulverised remains of asteroid and comet collisions in our solar system, it suggests that clay content and thus water content of these space rocks are high. Now that the team knows that clay rich asteroids may be abundant in supply the next step will see them trying to trace the origins of the cosmic dust to asteroids orbiting the solar system. They plan to do this by comparing how cosmic dust and asteroids reflect infra-red radiation to find parent asteroids that match the dust particle’s infrared signatures.